I start up Pianoteq but now it sounds different. Your settings used from the last session are reloaded upon start up. Check the parameter values or reset to default values by selecting a preset in the menu. I receive error messages when using/installing Pianoteq. If you encounter any error messages, or other serious issues, make sure that you are using the latest version. You can check the date of modification on the trial version page. For updates of the full version, visit the download area on our support page. I have problems downloading Pianoteq. What might be the cause? Make sure to disable any download managers that you may have installed. You can also try using another browser (e.g. Firefox). I use the trial version. Why are a few notes silent? This is a restriction that only applies to the trial version. It is described in the trial version download page. When I play on my keyboard the reaction time (latency) from key press to sound is slow. 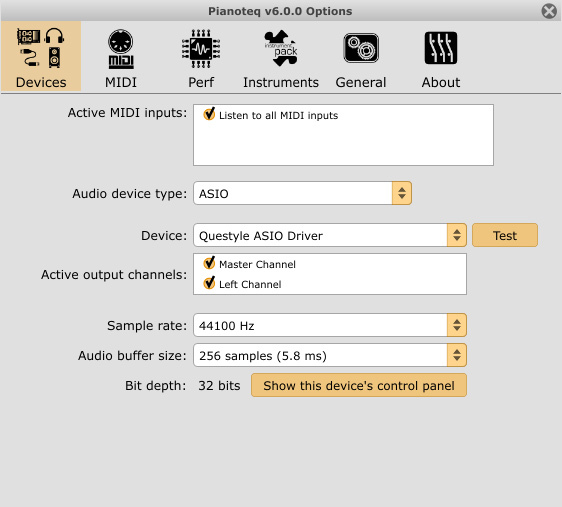 In the Pianoteq options devices tab (or in the audio settings of the VST/AU host), select your ASIO drivers as device and set the buffer size to 384 samples or below. See the example below. If you do not have any ASIO drivers, you can try using third-party drivers, such as ASIO4ALL. I hear crackles and pops in the sound. Make sure that your operating system is updated and optimized, free from spyware, trojans and CPU intensive anti-virus or utility programs running in the background. If using another CPU intensive VST instrument or effects plugin (such as convolution reverb), we recommend that you use it for playback and editing only if you encounter any issues. For playback and editing, increase ASIO buffer size to maximum. Although the latency will increase, the CPU load will decrease. If these adjustments do not help, your CPU may not be powerful enough (please refer to our hardware requirement specification). If this is the case you should reduce polyphony and/or the internal sample rate in the Options menu. You can also try reducing the number of output channels in the Microphones setting window. When using the sustain pedal, the acoustic noise is too loud. This problem can occur if using a non-progressive (non-continuous) pedal. You should in this case adjust the noise loudness in the action panel. I cannot load in the full version my Audio Units setting saved in the trial version. Settings that in the trial version are saved in Audio Units format cannot be loaded in the full version. First convert the settings to FXP format: run the trial version (reinstall if necessary), load your saved settings there and save them as FXP files (in the Options menu). You can load these FXP files in the full version. If you encounter any problems, contact us and we will assist you. I use a modern laptop. Still I hear clicks and have polyphony issues. Make sure that your computer is not running in energy saving mode. If it is, the CPU is running at a much lower speed which will result in performance issues. I hear distortion when playing chords. Sound saturation (0 dB) starts when you play chords with more than approximately 4 notes at maximum velocity (127). Depending on the sound card, you can reach this saturation much earlier (there are cheap DAC which saturate from -18 dB). Reducing the volume in Pianoteq should solve the problem. The sound becomes muddy when using the sustain pedal. In Pianoteq, the sympathetic resonance simulates the behaviour of a real piano. That means that you must release the sustain pedal often when using it, just like pianists on real pianos do. You may have another experience with certain digital pianos and sample libraries as the harp resonance in those is more simplified or non-existent. I own the Pianoteq Studio bundle but an instrument is in demo mode. If you purchased your licence less than a year ago, and you have installed an update which includes a new instrument pack, you need to update your licence in Pianoteq (Options - About - Update licence). I cannot find the grand pianos D4 and Model B, are they renamed? Yes, in version 6 they appear as Steinway D and Steinway B.
Cubase cannot see the Pianoteq 6 plug-in. In the list of VST instruments, Pianoteq 6 is now listed in the ‘Synth’ sub-category instead of being listed at the top. My 32-bit VST host cannot find the 64-bit plugin of Pianoteq. If you are using a 32-bit version of a host, it will not be able to recognize 64-bit versions of plugins, even if running a 64-bit operating system. You need to install either a 64-bit version of the host or the 32-bit version of Pianoteq. I cannot install Pianoteq, it says the file is corrupted. If the installer is corrupted it is most likely caused by an incomplete download. Try using another browser and check that the file size corresponds to what you see when hovering your mouse pointer on the installer file in the user area, as seen below. You can also try using a download manager. Press "L" (or click the Pen icon) to access the Preset Manager. There, click the Instruments header to sort according to instrument, then close the Preset Manager window. The preset menu does not open in Cubase 8. This is caused by a known bug in Cubase 8.0.0. Update to 8.0.5 or do as follows: In the plugin window, click the button with a little downward-pointing black arrow against a grey background. There, deselect the 'Always on top' option. If using Windows 10 Pro, and updating or enabling/disabling Hyper V, a duplicate activation slot may be required for the same PC. This issue should be fixed in version 6.1 and later.